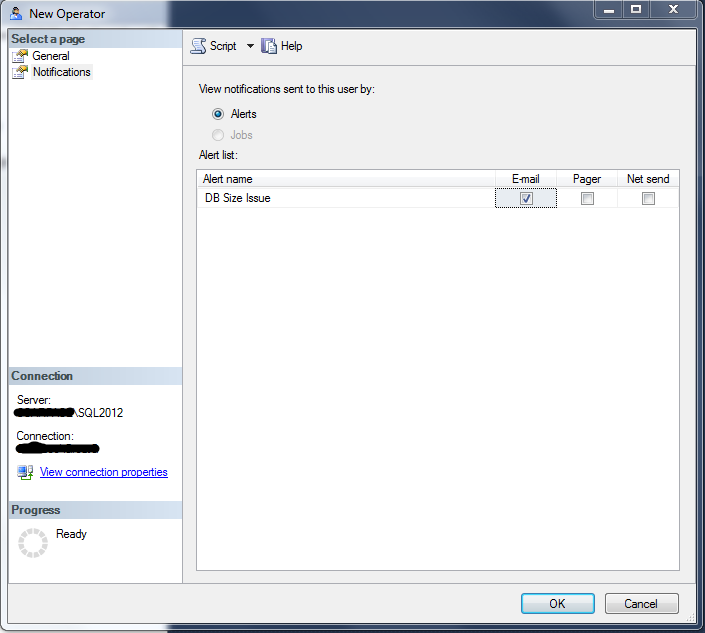 And in 2nd part, you setup for what alerts and jobs you want this operator to get notified. And means of notification too. If you have already created Jobs or Alerts then they will be visible here gives you convenience to select them for notification for this operator. 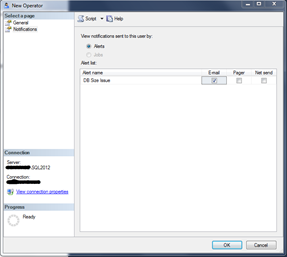 Once operator is created, next step is to create alert. 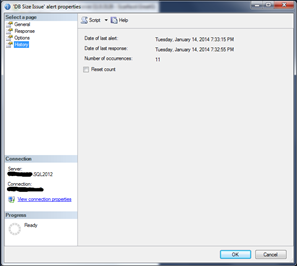 For that goto SSMS –> SQL Server Agent –> Alerts. Right click on Alerts and select “New Alert”. 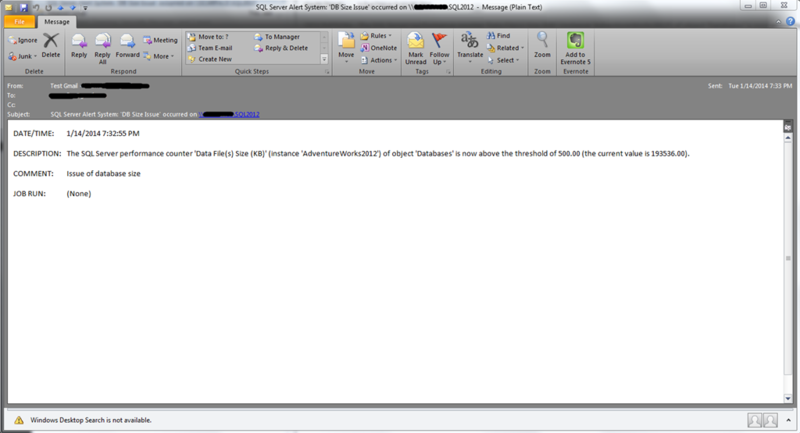 This TECHNET page gives more details about different alert types. In General section you will see that you can define alert for 3 different types, SQL Server Event, SQL Server Performance Condition or WMI Event. And even for these alerts are further divided into many different categories. You can define alert for specific database or for all databases. 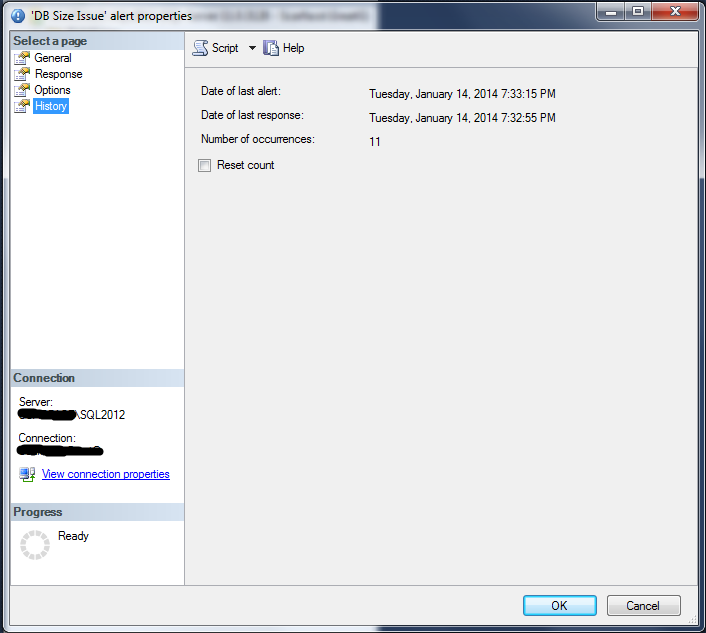 Further you can refine it by specific error number or by severity (which varies based on type of event type). You can even raise alert based on some error message, which I think is pretty helpful when you want to raise alert using your own code. In Response section, you can define how you want to respond to specific alert. You can either run some specific job (defined in SQL Sever Agent) and / or notify operator using email, pager or net send. And last section is Options, in which you specify how much interval you want to keep between alert notifications and weather you want to include alert message in Email, Pager or Net Send with some additional message. Actually there is one more section called History, which becomes visible once you setup alert and enable it. For demo, I created an alert which notified an operator (that we created previously in operator section) when database file size of Adventureworks2012 database rises above 500KB. I know it is not realistic condition but since I am feeling lazy just bare with me … When this condition occurs, I am notifying operator via email at interval of 1 min. Alert notifications are really great feature of SQL Server. It simply allows you to monitor Server health without much of effort. 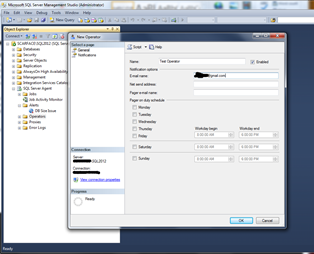 Only downside I see is since it relies to SQL Server Agent to sent notifications, it is not available in express edition. This entry was posted by Gaurang on January 16, 2014 at 7:36 pm, and is filed under How To, SQL Server. Follow any responses to this post through RSS 2.0. You can leave a response or trackback from your own site.